Oh honey I would so be a Griswold if the electric rates here were not so high. I love Christmas and love all the lights. We pile up in the car and go look at all the lights and displays as a family outing. We barely light the inside of the house with more than one or two lights on at a time and I am going to wrap the abode in lights...that's about as likely as me or the old lady turning the furnace up above 62 degrees.ha ha ha ha ha ha I just love the weirdness of the month when mass medications should be "presented" to most of the people. I wonder if the authorities would make a concession if the new style LED lights were used. You know, the going green way to go Griswold! Baintree, MA? That's where John Adams lived -- I wonder if his ghost is corralling the squirrels to harass the mayor. Would serve him right. Take down the lights, buddy. We have a whole town nearby that lights up at Christmas. It is beautiful. I have to agree, the squirrels have a right to chew up anything left strung up after New Years. We have a single strand of the giant multicolored lights that trims the rain gutter across the front of the house. It says we're tacky, but in a conservative way. No kidding! I can't stand it when people leave their lights up all year. How lazy can you get? The squirrels have the right idea - and more power to 'em! There are a number of homes in town who do Griswaldesque displays, which you either love or loathe. The rubbernecking traffic down their otherwise quiet streets at night is mind boggling and dangerous though. I prefer tasteful elegance. Enough to say "Oh wow, that's so pretty", but not enough to cause anyone to slam on their brakes or swerve into a neighbor's mailbox. I love Christmas lights. We brought the LED to save a little energy. I live very close to Braintree and missed this news tidbit. Squirrels had a go at the plastic apples on our wreath one year though...so it makes sense. Lesson learned. Cutting corners? Never a good idea. 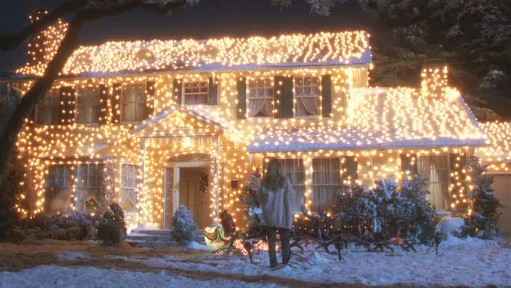 I don't mind anyone who goes all Griswold on their house...as long as they them them down when the holidays are over. And I mean the Christmas holidays...not the 4th of July! My husbands father does the big light display every year. Last year he made the paper with the lights he has up. He lives for the holiday. Personally, I'm happy to go look at the light, rather than have them up at our house. With the snow and such, putting up lights and taking them down is a pain. There is a family near us that has his own radio station you listen to when you drive up to his house!! It's awesome. we drive to a neighbourhood near ours every year to see the decorations. Every house is done up to the nines, and the whole street is like a magical wonderland. I am lucky to get a single strand of lights up on one bush at my place!! I live on LI and had no idea this happened! However, that being said... NY in general is just an odd state. It's like someone with multiple personalities between the Island people, the Manhattan people, and the upstate people. I'll be glad when hubs finishes residency here so we can move somewhere with less weirdos. That is the most ridiculous and un-festive (new word?) thing I've ever heard. For gods sake, let people have some enjoyment at the holidays. Go catch rapists, drug dealers, and murderers and leave productive citizens alone. I love when people put up Christmas lights in their yards and they're colourful and festive and lovely, but there's no denying that some people go a little overboard. Which, you know, I really think is up to the individual and I support their right to be as festive lightey as they wish and to enjoy the ensuing power bills. Within reason. However, I don't much want to have to fall asleep to what looks like a nuclear blast every evening, or have to invest in curtains made of kevlar and military grade canvas just to get some sleep either so you know...moderation is key people. Key to my psychological well being and key to YOU staying alive. A few colourful festive lights are nice, too many is tacky and annoying. I have spoken. Personally, I'm lucky if I get a tree up and decorated. I don't put lights up outside. But I do enjoy taking a ride around town to see what otherrs have done. Maybe Chip and Dale just didnt want the Mayor leaving their trees all redneck style with the year round lights? On the one hand, I love looking at Christmas lights. On the other hand they are a huge energy drain (as well as a fire hazard) and the environmentalist in me recoils. I think it's beautiful! If it helps to provide charity in some way, I'm even more for it. Amen. I love looking at other people's lights but don't have nearly enough energy or desire to put up my own display. Incidentally, I just posted this same Griswold picture but I did so before visiting here. Honest.